Santiniketan is a small town and famous tourist near Bolpur in the Birbhum district of West Bengal. An International University founded by Nobel Laureate Rabindranath Tagore with an idea to assimilate Indian traditions with the best of other cultures of the world. 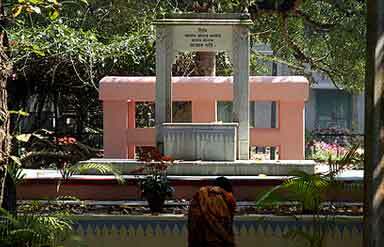 Shantiniketan is the abode of peace which was initially an Ashram founded in 1863 by Maharishi Devendranath Tagore. In 1901 his son Rabindranath Tagore converted it into an experimental open-air school with just five students. It proved a success. He widened the scope of studies which gradually formed University. This national university is renowned as Visva-Bharati which summons scores of tourists, scholars, artists and eminent personalities round the year from several parts of the globe. This is a university town in West Bengal which has become a tourist spot because of its association with Noble Laureate Gurudev Rabindranath Tagore who is one of Bengal's greatest figures. 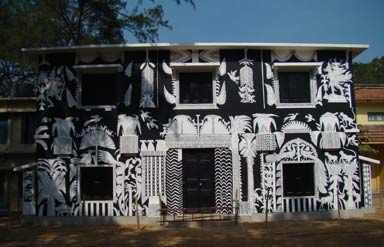 The natural charm of Shantiniketan is a major drawcrad in itself. The main attractions of this place include the various buildings of the Visva-Bharati campus. The Chinese Faculty which is famous its architectural buildings and various artifacts gifted China as symbol of their good relationship. It is the meditation room where Maharshi Devendranath the father of Rabindranath Tagore used to meditate. Prayers are held at Convocation time in which successful graduates of the Vishwa Bharati University are presented a branch of five leaves each from the Saptaparni trees which abound in the area. It is among the famous attractions of this university which is known round the world for its sculpture collections. 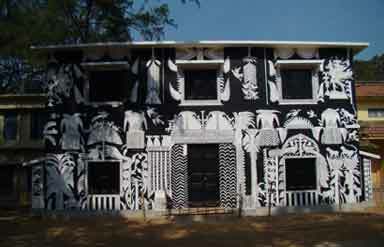 The museum of this place exhibits exotic collections sculptures, frescoes, murals and art books. This diverse collection summons scores of arts lovers to this place from several parts of the globe. This place also known as the Rabindra Bhavan is a Research Center and Museum exhibiting belongings of Rabindranath Tagore like paintings, various editions of his works, clothes, beds and utensils used by him. The Bichitra or Rabindra Bhavan is designed by the poet's son Rathindranath Tagore. There are five abodes of the Tagores namely Udayana, Konarka, Shamali, Punassha and Udichi. Besides, Chhatimala, Upasana Mandir and Shantiniketan Bari are some of the oldest sanctums where Rabindranath Tagore used to meditate and spend his leisure. Inside the Visva-Bharati campus many social and cultural events takes place throughout the year. These cultural events are known for their vibrant celebrations showcasing richness of Bengali culture. Some of the known cultural celebrations are Basanta Utsav, Barsha Mangal, Sharodutsav, Nandan Mela, Poush Mela, Magh Mela and Rabindra Jayanti. The Poush Mela is among the most famous fairs of this place. It is celebrated for three days in the on the seventh day of the Bengali month Poush (usually, last week of December). The vibrant celebration of this mega cultural event summons not only tourists but also artisans, folksingers and dancers from several parts of India to present their talent. By Air: The nearest airport is Kolkatta which is located 213 km away from this place. By Rail: The nearest railhead is Bolpur which is 2 km away. This railhead is connected with several parts of India with mail, express, fast and super fast trains with several parts of India. By Road: Good roads connect Shantiniketan with Kolkatta which is 213 km from this place. Tourists can hire taxi, State Transports Buses and Private Buses to reach this place. This place can be visited round the year because of pleasant climate yet the best time to visit this place is during spring season. It is the time when Shantiniketan is blooming to its fullest amidst the lush greenery.